The work of Glenn Whitehouse of Ontario, Canada. Photos by Glenn Whitehouse. Click on the thumbnail to see the full size photo. As a Custom Builder of cars I was approached by a few modellers and historians to see if I would construct some Detroit Peter Witts. As these cars were quite unique and, being a Witt Fan, I decided to try my hand at them. Jack Schramm, a former DSR Employee and noted Author of Traction Books living in Warren Michigan wanted a model of DSR 3850 for his 80th Birthday on July 27th. 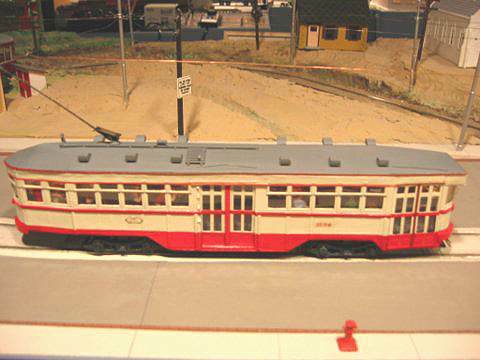 3850 was the car he chose, as it was the only one of this type constructed in the DSR Shops. DSR 3756 one of Group 9 Peter Witts purchased in 1929 from Perley A. Thomas Co. and called "The Detroiter", was one constructed for Howard Ziegel of Livonia, Michigan. Both cars are quite different in appearance. The cars are constructed of styrene bodies (layered) with the outer skin containing rivet detail, etc. The floors are of 1/8" bass wood, and I use the "Ivor Walsh" method of drop out floors containing hidden wiring with 2/56 screw mounts for contact points. Trucks are of course "Q" Car to suit the particular car. The interiors of the cars are completely detailed with seats, passengers and lighting. The lighting consists of four 14 volt 3 mm. dia. light bulbs. The head lights are LED's. All are wired off the two interior light bars in the roof. The roof is also constructed of formed styrene sheeting over interior formers similar to model aircraft construction. The canvas effect of the roof is done with strips of 11/2" masking tape., as is the interior of the roof. Once painted they look like the real thing. The cars were spray painted as close as possible to the original cars. Pin Striping is Chart Pack Tape or the type used for auto's, and lettering is either Dry Transfer or Decals. A complete set of destination signs has been prepared by one of my fellow modellers and computer geek. They are being done on matte photo paper for insertion into the back lit sign boxes. 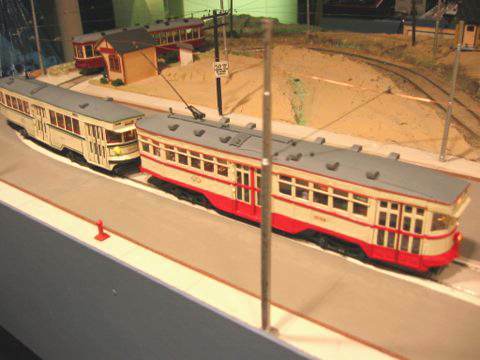 Niagara St. Catherines & Toronto was considered to be the last truly Interurban system to operate both passenger and freight trains in regularly scheduled service in North America. The N S & T also operated steamships that once plied the waters of Lake Ontario. The last passenger service was I believe 1959, while freight service continued till 1960. After 1960 diesel power was the norm under the CNR banner. Much of the original track network has been cut back by the CNR as trucking became the norm. N S & T locomotive No. 17 shown in these photos represents the type of equipment that could be found on this once great traction system. This locomotive was a 50 ton, 35' long by 9' wide version of a number (12) that were constructed for the Hydro Electric Power Commission of Ontario between 1918 and 1920. 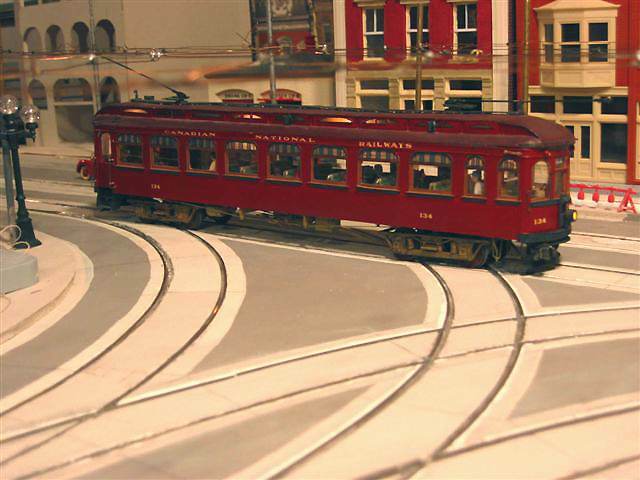 The locomotive car body was built by The National Steel Car Company at it's Hamilton Ontario facility. 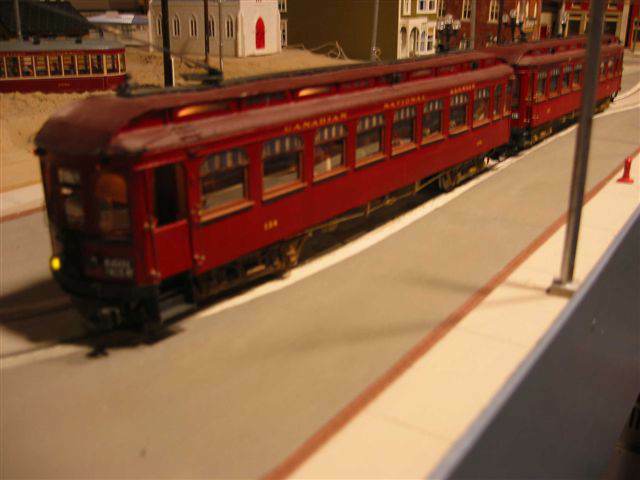 Electrical and motive power was supplied either by Westinghouse (6) or by General Electric (6). It is not clear which Company supplied the electrical power for No.17. No. 17 was acquired by the N S & T in 1926 after the HEPC had finished the Queenston Hydro Generating Project at Niagara Falls Ontario. No. 17 was in service until closure of the electric operations in 1960. 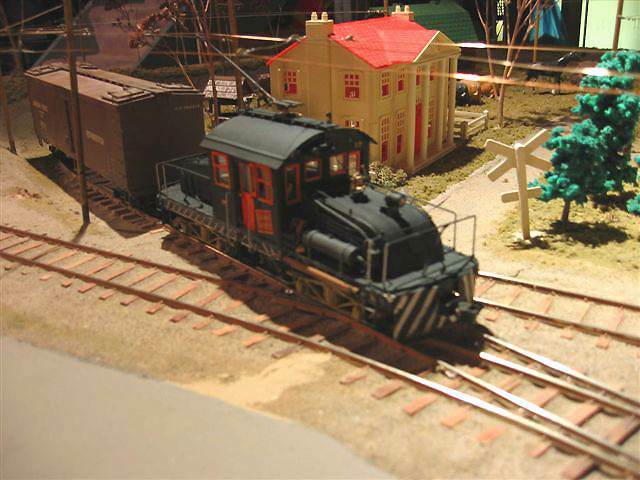 The locomotive was then sent to the Oshawa Railway ( a CNR subsidiary) where it continued in service for another four years. Locomotive No. 17 was scrapped in June of 1964 at the Standard Steel Company in St. Thomas Ontario. This model of No. 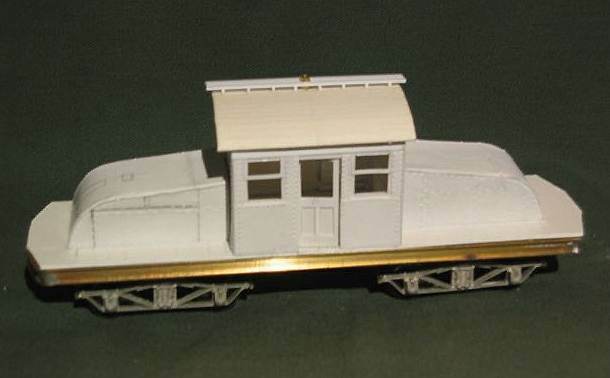 17 was constructed for Phil Spencer of Toronto, and in the First Image shows its basic construction comprising a brass channel frame and cross members with a body shell composed mostly of styrene with some bass wood floor components. The trucks are Q Car 6' - 0" Arch Bar Design as was the prototype. 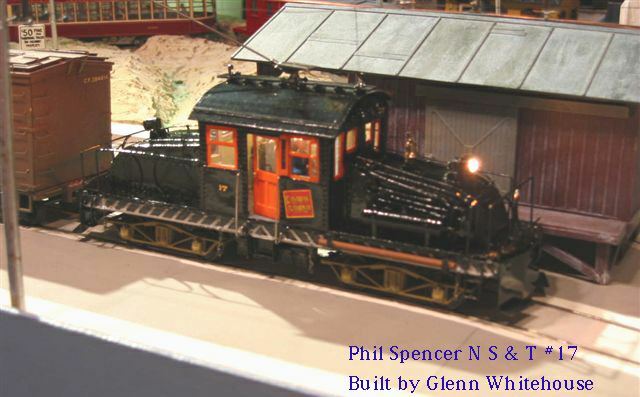 A second model of this loco is presently under construction for Bill Salton Of St. Catherines, Ontario. The Second Image shows the locomotive at the freight shed in it's finished stage prior to being dull coated and installing KD Couplers. The Third Image shows the locomotive after dull coating (what a difference) with couplers in place. 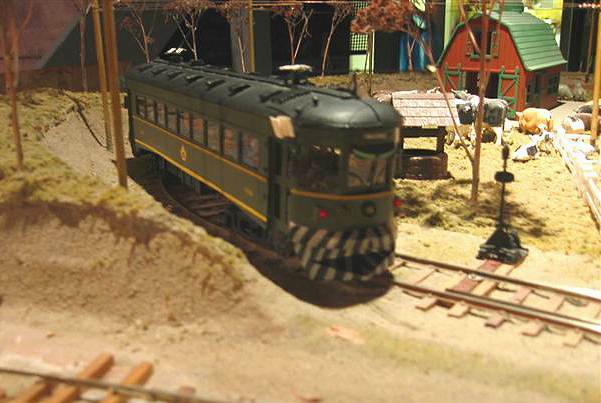 The interior of the loco is lighted as are the marker lights and head lights. 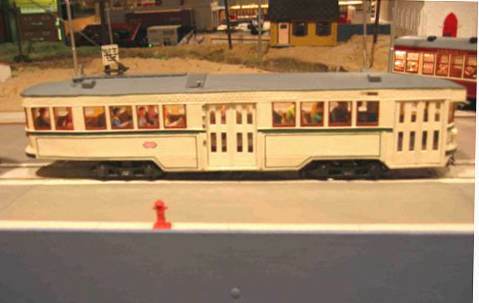 It also has details such as controllers, engineer (2), opening doors. The entire project took about four months to complete. The Fourth Image is of another N S & T piece of equipment that I constructed for Bill Salton of St.Catherines, Ontario, being car No. 620, formerly M & S C No. 620 ( Ottawa Car Co 1930 - Length 51' - 2", width 8' - 51/2"). The model is of etched brass construction with a bass wood floor. The brass sheet was acquired many years ago from the US (origin unknown). The etching was of single depth and required considerable work, such as cutting out and recessing the doors, cleaning out the windows etc. The model is completely detailed inside, and includes the unusual double door system that was on this car. It was finished as per the final version of this car which lasted till the very end of service. Trucks - Baldwin 6'- 0" (Q Drive) and detail parts supplied by Q Car Co. The Fifth and Sixth images are of N S & T car No. 134. This car was built by The Preston Car and Coach Company in Preston Ontario, in 1914. It is an unusual combine in that only one side had a baggage door. The car was 58'- 0" in length and 9"- 6" in width, and had 6"- 6" Taylor trucks. This model along with a model of No. 135 was constructed for Bill Salton of St.Catherines, Ontario. 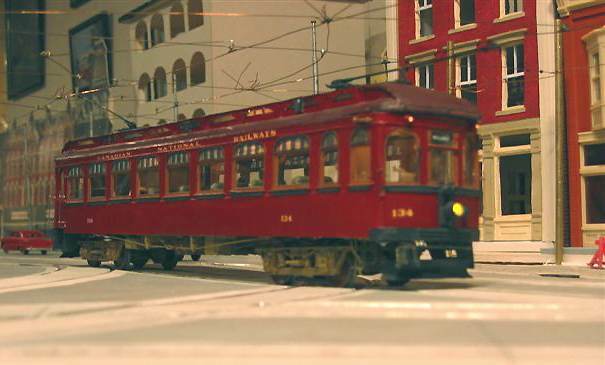 These cars are constructed with bass wood floors, a combination of styrene and card stock body parts are completely detailed and lighted. All detail parts are from Q Car including the Taylor Trucks. 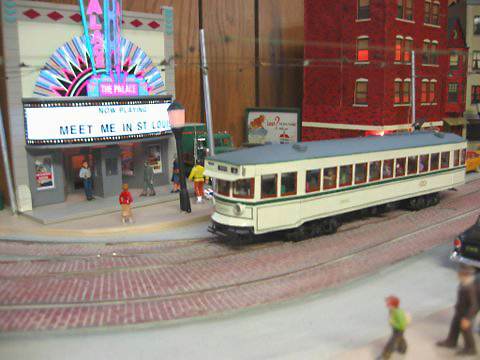 These models placed first in the Master Modellers Contest of the East Penn Model Meet a few years ago.